The big (and only) number this week comes from Portland’s own 2016 WPT Five Diamond Champ James Romero, who’s been living up to his post-win promise to travel the world “donating the money back to professional poker players from every country” with cashes this year in the Bahamas, Australia, and Canada (as well as across the US). He placed 49th out of 1,682 entries in the Main Event at the PokerStars Championship Main Event in Barcelona. We’re looking for good things today from Jeffrey Mitseff, who double-qualified for the $100K GTD Big HORSE tournament at The Bike over the weekend. He started Day 2 (Tuesday) in 5th place (and 18th place) out of 48 advancing players. There were two other players who qualified twice; Jeff was the only one of the three with two above-average qualifying stacks. The final numbers are in and there’s a new champion here in town. The PPCS3 started the last game on Sunday with a 4-way tie at 50 points (three first-place finishers and a fourth player with two cashes equalling 50 points), but Thai T. got into the money for just enough points to push him ahead of the others. It may not be a perfect point system, but at least the winner was someone who made a final table this time around! Congrats to Ben May and Brian Sarchi, and the staff at Final Table and Portland Meadows, and to all of the volunteer dealers (except for those who done me wrong!) who keep the game of poker running in Portland. And what the hell, thanks to the players. Well, you still won’t know for sure, but you can check out a couple of sample hands from the trials of the Radio Frequency ID (RFID) table at Portland Meadows that they put together. No live streaming plans, but that gives the Guys time to put together a nifty production without a big crew. UPDATE: Friday’s game at Final Table is not a $20K GTD due to the Labor Day Weekend. Friday is the first of the month, which means it’s First Friday, which should mean a $20K GTD at Final Table to follow up on the PPCS3. And it’s Labor Day Weekend, when the plight of the working man is traditionally celebrated with games of chance, so who knows? There may be some special events announced at the last minutes. Another Muckleshoot Summer Classic Satellite is tonight at 7pm. One out of ten players ($125 buyin) gets a choice between two packages of seats in the series. The last Wednesday satellite is next Wednesday. There are $225 Mega Satellites for all five events in the Classic Sunday, 10 September at noon, and at 7pm on Monday and Tuesday, 11 and 12 September. The Classic starts two weeks from today. Heartland Poker Tour at Ameristar East Chicago runs through Labor Day. Flights into the $1,650 Main Event are Thursday through Saturday at 2pm on the first two days and 1pm on Saturday. There are $375 satellites running through Saturday morning and some side events. Last-minute travel over the holiday and with massive disruptions through the Southeast are likely to lead to some problems, but there are still $230 round-trip tickets for Saturday morning (with departure just after midnight Friday) that would get to Chicago with plenty of time to make even the 10am satellite if everything connects. The Venetian Deepstack Extravaganza 3.5 starts tomorrow with four weeks of events. The big early event is an $800 buyin 8-Max with a $200K GTD and there are four smaller buyin events with six-figure guarantees. The Commerce Poker Series starts Friday, with an early $350 buyin $100K GTD. It features a $1M GTD Main Event ($1,100 entry), a $5K NL 2-7 Triple Draw tournament, and some big bounty tournaments. Sunday at Eugene’s Beach Poker Club is their $135 buyin Monthly Big Tournament. Labor Day at Stone Gambling Hall is a $15K GTD Win the Button tournament, where the button is assigned to whoever won the last hand. Little Creek Casino’s South Sound Poker Championship starts Tuesday with a Seniors (50+) tournament at 11am. There are six events (most at 11am), including a $340 Main Event with $5K added to the prize pool. Little Creek is in Shelton, Washington, west of Olympia, about 125 miles from Portland. A week from Friday (8 September), Heartland Poker Tour moves to Golden Gates Casino in Colorado. In addition to qualifiers to the Main Event (starting 13 September), the first days feature four entry days for a $400 buyin. 8 September is also the start of Deepstacks Poker Tour’s Battle of Alberta: Edmonton at Casino Yellowhead. There are several days featuring satellites to multiple series events and a C$1,100 C$250K GTD Main Event. Also, NLH/PLO mix and a C$660 PLO 8-Max. About $430 RT (in US dollars) and you’d be flying on 9/11 if you want to make that one. C$660 is about $530. If money’s not an issue for you, the Aria/PokerGO Poker Masters is coming up in two weeks with five events. Buyins of $50K and $100K, but if you had to ask, you can’t afford it. If you enter all four of the $50K events you get into the $100K free rake-free! Stomping on two other Northwest-adjacent tournament series (Muckleshoot and Chinook Winds), the World Series of Poker Circuit Thunder Valley comes to the Sacramento area 14 September. It features PLO, NLHE 6-Max, and HORSE ring events, as well as a $1,675 Main Event (with entry flights 22 and 23 September). Los Angeles’s Gardens Poker Classic/Poker Night in America runs through the second half of September, kicking off with a $565 Main Event with $1M GTD and 12 entry flights. At Talking Stick Resort in Arizona, the Arena Poker Room Seniors Poker Open runs 16–18 September, with a $500 buyin. And last but not least, it’s the Chinook Winds Casino Resort Fall Coast Classic starting 16 September with the popular $75K GTD NLHE 6-Max. Official point publications are linked here. The undisputed champ of this week’s leaderboard is Max Young, who’s been crushing the national poker circuit this year after years of local crushing. His latest, biggest win comes at Philadelphia’s Parx Casino, in the Main Event of the series, a $1,600 entry (Max said on Facebook that he fired two bullets) with 447 entries and a prize pool of $650K. This is Max’s 21st recorded cash in 2017 (with four months and change left to go), his eleventh final table and fourth five-or-better figure cash this year, plus he won a World Series of Poker Circuit ring in Florida in February. Maybe I’ll stop holding a grudge against him for sucking out on me in an Aces $25K guarantee four years ago and just say I knew him when! New on the list this week is David Froyalde from Federal Way. 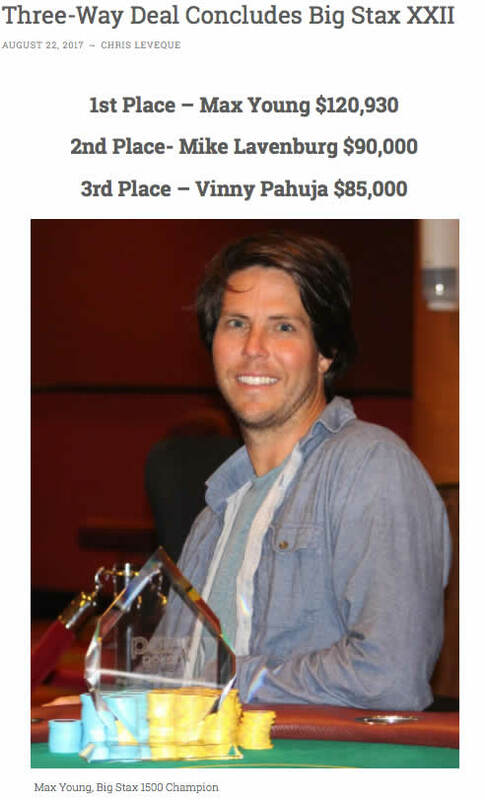 David’s very first Hendon Mob cash is a doozy: first place in the Venetian August Weekend Extravaganza Event #1, with a buyin of $250 and 618 entries, with a prize pool of $126,690. Down in Florida at the Seminole Hard Rock Poker Open, Mill Creek, Washington’s Charles Coultas notched first in Event #15 PLO, with a $2,650 buyin and 99 entries, while Scott Clements placed 24th in the $5,250 NLHE Championship. 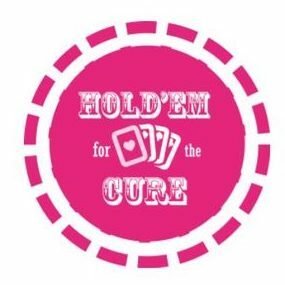 The annual poker benefit for the Susan G. Komen Sleep In for the Cure fundraiser is Friday. Top prize is a trip for two to Las Vegas. It’s a $50 buyin, at the iHeartRADIO Portland Lounge in Tigard, with proceeds going to fight breast cancer. The first two games of the PPCS3 are in the bag and the race for the championship belt is on, using the new World Series of Poker Circuit-based system. So far as I can tell, there were no repeating cashes over the weekend, so it’s theoretically anyone’s game. For those unfamiliar with the system, a set number of points are awarded to the final table (ranging from 50 for first place to 15 or ninth place. Then, of the remaining in-the-money players, the bottom half get 2.5 points, the top 20% get 10 points, and the middle 30% get 5 points. Saigon Vic and Jim Hissner are tied for the lead, this weekend’s games will determine who gets the belt. I did not cash, but there’s still time! The prize pool Saturday got to nearly $39K (with a $20K GTD); I was out before the end of rebuys (and before addons) on Sunday but there were already 132 entries with 57 rebuys with 13 minutes left. Saturday at noon is a $30K GTD tournament at Final Table, with a $120 buyin (and one live rebuy) with a $60 addon. Coming up on Sunday is the big one: a $50K GTD at Portland Meadows. The entry fee is $200, and addon is $80. Good luck to everyone! I hope to see you all. I’ll be the guy with the trophy on the rail. I hadn’t seen dates for it before last week’s post, but Run It Up Reno returns in October with eight days of affordable tournaments including HORSE, O8/S8, PLO/Big O, and NORSE (NLHE + ORSE).. The Bicycle Casino’s Legends of Poker features one of the biggest guarantee HORSE tournaments I’ve seen, with $240 and $350 buyins over six flights for a $100K GTD. The twist is the O is Big O. Friday is a Survivor tournament with a $5K payout, and Saturday it’s a $10K payout. How can I resist? I can because I have to work. It burns! Friday is also the first of three entry flights for the WPT Main Event, a $4K buyin. Last year’s event had 687 entries and a prize pool of nearly $2.5M. WPTDeepstacks at Reno Atlantis has a $200K GTD Main Event ($1,100 buyin) starting Friday at noon. Saturday is another flight, with Day 2 on Sunday and the final table on Monday. The second Muckleshoot Summer Classic Satellite is tonight at 7pm. One out of ten players ($125 buyin) gets a choice between two packages of seats in the series. The satellites run weekly through 6 September. Sunday is Muckleshoot’s $300 buyin Deepstack. Today is the start of the Horseshoe Poker Classic in Council Bluffs, Iowa (across the river from the Omaha airport). Its Main Event has five flights through Saturday August, with Day 2 on Sunday. Heartland Poker Tour returns to Ameristar East Chicago tomorrow, which is always one of their bigger stops. They open with a $200K GTD ($350 buyin); the Main Event begins 31 August. At 9:30am Sunday, Lucky Chances Casino holds its monthly $20K GTD to first place tournament. $375 including the staff appreciation. The monthly No Chop at the Top tournament at Tulalip Resort Casino is at 11am on 27 August. $230 (including dealer addon) with $5K added. The Venetian Deepstack Extravaganza 3.5 starts 31 August with four weeks of events. The big early event is an $800 buyin 8-Max with a $200K GTD and there are four smaller buyin events with six-figure guarantees. The Commerce Poker Series starts a week from Friiday, with an early $350 buyin $100K GTD. It features a $1M GTD Main Event ($1,100 entry), a $5K NL 2-7 Triple Draw tournament, and some big bounty tournaments. Little Creek Casino’s South Sound Poker Championship starts 5 September with a Seniors (50+) tournament at 11am. There are six events (most at 11am), including a $340 Main Event with $5K added to the prize pool. Little Creek is in Shelton, Washington, west of Olympia, about 125 miles from Portland. The 69-year-old Vietnam veteran considers himself a jack-of-all trades, someone who can learn a new skill just by watching. He spent years as a commercial roofer. He doesn’t smoke, doesn’t drink, and doesn’t do drugs. “My biggest crime in life is playing poker, and I love doing that,” he said. 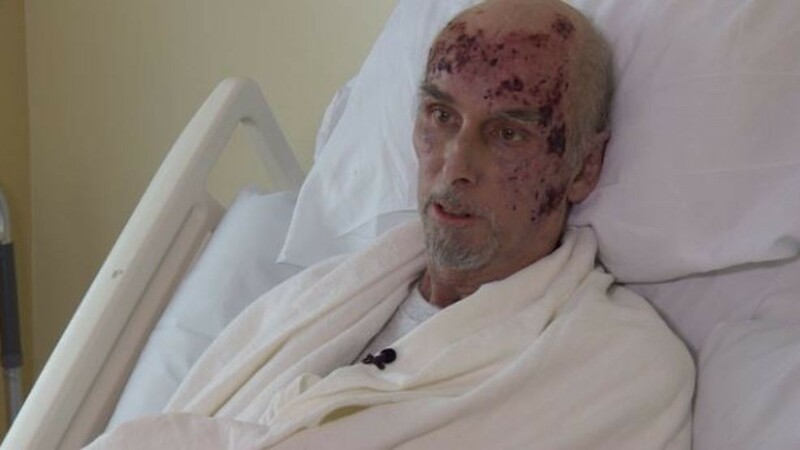 For those who don’t know the story, almost exactly four months ago, Scott Ranstrom was sitting in a Denny’s on Southeast 82nd Avenue just south of the Portland city line using their wi-fi playing online poker and doing some other tasks, when a man he’d never met walked in, doused Ranstrom with gasoline, and lit him on fire. Ranstrom spent two months in a coma, and he’s still in the hospital, with a long road of recovery and rehabilitation ahead. Nearly every article since the attack has mentioned his love of playing poker, and the update that ran on KATU the other night was no exception, with Ranstrom telling reporter Keaton Thomas that he’s going back to playing poker once he gets out of the hospital. It also mentioned that his GoFundMe site, set up to cover extensive medical expenses, had raised just $40K of a $100K goal. I’m keeping both of these up front here in the Planner for the next two weeks. The PPCS3 starts Saturday at noon at Portland Meadows with a $20K GTD tournament. It’s a Freezeout with a $165 buyin. No rebuy, no addon, and a 25K starting stack. Everyone gets a pass from me for the first game (as a player at Meadows pointed out the other day, I do have the champion’s trophy for the last Portland series!) but the point system has been corrected, so that’s not likely to happen again. Sunday at noon is game two of four, this time at Final Table. Another $20K GTD, using the format for Final Table’s monthly First Friday tournaments: $80 buyin with $80 live rebuy and $40 addon. The annual poker benefit for the Susan G. Komen Sleep In for the Cure fundraiser is two weeks from Friday. Top prize is a trip for two to Las Vegas. It’s a $50 buyin, at the iHeartRADIO Portland Lounge in Tigard, with proceeds going to fight breast cancer. Just one new name on the leaderboard this week (and by “new” I mean according to the ever-changing set of arbitrary rules I use to put it together): Jeffrey Farnes of Salem got his first Hendon Mob rating with an impressive 15th place at the Ante Up World Championship at Thunder Valley outside of Sacramento. The $1,650 buyin event busted the $500K GTD with almost 500 entries, The numbers at the top look like some sort of deal was made at the unofficial final table; the player who came to the table as chip leader walked away with more for 8th place than anyone except the champion. Max Young of Seaside, Dylan Linde from Couer d’Alene, and Kindah Sakkhal of Bothell represent all three states in the US Pacific Northwest and they were all in Cherokee North Carolina for the World Series of Poker Circuit stop that included the Global Casino Championship. 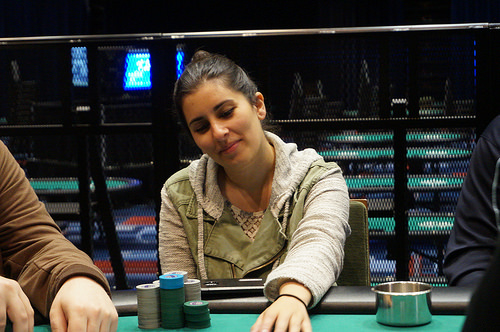 Max cashed in the stop’s Main Event for 28th place (knocked out by the eventual winner, Harry Arutyunyan), and Kindah went on to take 4th place in the 1,022 entry tournament. Linde took 6th place in the Global Poker Championship (from 124 entries who had to qualify through the WSOP point system). Hit the million mark with 63 players left. Average is 700k. LFG!!! Rounding out this week’s top scorers, Seattle’s Matt Affleck fell just short of a win in the Seminole Hard Rock Poker Open Purple Chip Bounty. I’m an old white guy. But in my younger days, I lived for a few years with a woman who grew up in Compton during the Watts riots. We were sometimes harassed on the streets of “liberal” Eugene back in the ’80s, and other stuff happened when I wasn’t around. The best man at my parent’s wedding was interned during World War II until a couple years before he met my father in grade school. I’ve got family with Japanese roots and others with African-American adoptees. 30 years ago, skinheads living around the corner from my house beat an Ethiopian student named Mulugeta Seraw to death with a baseball bat a half mile away. So please, if you’ve got some sort of “explanation” for why you think the events in Charlottesville last weekend were somehow not racist or that there are “many sides,” or that I’ve been “fed” propaganda, save your energy for someone else, because the only thing you’re going to convince me of is that you’re a racist. Even if nobody died or was hurt last weekend, it would still have been a bunch of racists gathering to protest the removal of monuments to racists who fought to preserve slavery. Suggesting that after I’ve made it to the age of 55, after running for the Oregon Legislature more than two decades ago, after writing a political blog for several years, and after two years of research for a book on Democratic Party foreign policy, that you’ve got some special insight into politics that I haven’t developed is not only insulting it’s stupid. And really, messaging me that you’ve “lost all respect” for me because I won’t bother to watch your pro-Nazi videos just convinces me I could care less about your opinion, Mike H. George McGovern dropped bombs on Nazis. 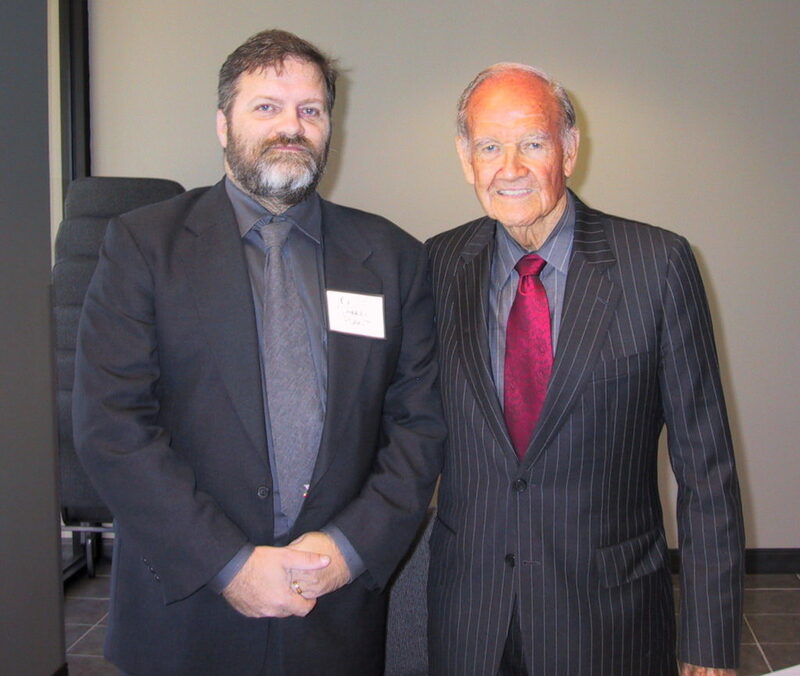 With 1972 Democratic presidential candidate Senator George McGovern, at the 2007 McGovern Conference in Mitchell, South Dakota. The Bicycle Casino’s Legends of Poker is closing in on its last couple of weeks. Entry flights for Mega Millions XVII run through Monday. Two daily flights for $160 buy-in with a $100 addon (5% of players advance to Day 2 on 22 August)); and weekend flights for $550 with 10% advancing. Monday and Tuesday are $460 Mega Satellites for direct entry into Day 2 (starting with 60+ big blinds). Tuesday is a $550 PL Mixed game (PLO, Big O, and Triple Draw Badugi, $30K GTD), with a $1,100 buyin $100K GTD NLHE tournament on Wednesday and a $50K NLHE Nounty tournament (same buyin) the next day. Wednesday is also the first of six flights for the Big HORSE tournament (with Big O instead of Limit Omaha Hi-Lo). There’s a $100K GTD for that. The first three flights are $240 with 10% getting to the money, and the final three are $350, with 15% making Day 2. The Main Event for the Golden Gates Casino Colorado Poker Championship Summer is this weekend with flights on Friday and Saturday. $1,100 buyin. Friday is also Day 1A for the Deerfoot Inn & Casino Summer Super Stack Main Event. It’s C$1,500 with three entry days and ends on the day of the eclipse (21 August). The Venetian August Extravaganza runs through Sunday. Friday and Saturday are flights into an $80K GTD NLHE tournament with a buyin of $340. Sunday at noon is a Crazy Pineapple tournament at Eugene’s Beach Poker Club. $75 buyin with $20 addon. You can call the club early to get a 1K bonus. A week from Sunday is their big Crazy Pineapple tournament! Cactus Pete’s is in Nevada, but nowhere near Vegas. It’s just about due south of Twin Falls Idaho, in Jackpot. They host Pokermania for five days starting next today, with 12 events. The first Muckleshoot Summer Classic Satellite is tonight at 7pm. One out of ten players ($125 buyin) gets a choice between two packages of seats in the series. The satellites run weekly through 6 September. Sunday at noon is the first of four Mega Satellites; $225 gets you into contention for entries in all five days’ events. At noon the next Sunday (27 August) there’s a $300 Deepstack). WPTDeepstacks returns to Reno Atlantis tomorrow for 12 days of action, inclluding a $200K GTD Main Event. This Saturday and Sunday are $400 flights to a $50K GTD NLHE. Next Wednesday is the start of the Horseshoe Poker Classic in Council Bluffs, Iowa (across the river from the Omaha airport). Its Main Event has five flights between 23 and 26 August, with Day 2 on 27 August. In just a week, Heartland Poker Tour returns to Ameristar East Chicago, which is always one of their bigger stops. At 9:30am the morning of 27 August, Lucky Chances Casino holds its monthly $20K GTD to first place tournament. $375 including the staff appreciation. After an initial announcement that they’ve be opening today, Sally Jean announced on the NW Poker Facebook group that Room 52 PDX is going to be delayed while the owners of the establishment finish some licensing issues. Here’s hoping the best for everyone involved. After setbacks over the past couple of years, it’d be good to see some new options. Portland poker whack-a-mole! The annual poker benefit for the Susan G. Komen Sleep In for the Cure fundraiser is two weeks from Friday. Top prize is a trip for two to Las Vegas, with other top finishers getting a seat in the Chinook Winds Fall Coast Classic main Event next month, trips to Chinook Winds, and more. It’s a $50 buyin, at the iHeartRADIO Portland Lounge in Tigard, with proceeds going to fight breast cancer. 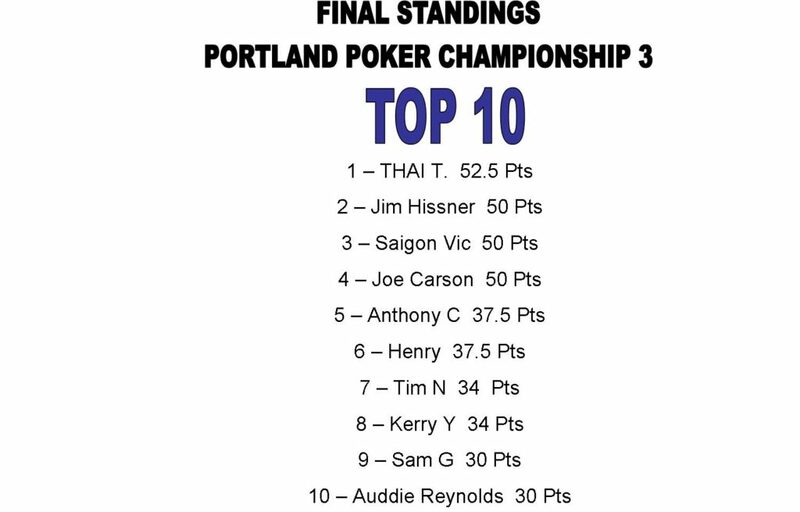 The pleas of the poker public have been heard, and it looks like there’s going to be an attempt to install someone other than the Poker Mutant as the champion of tournament poker in Portland. 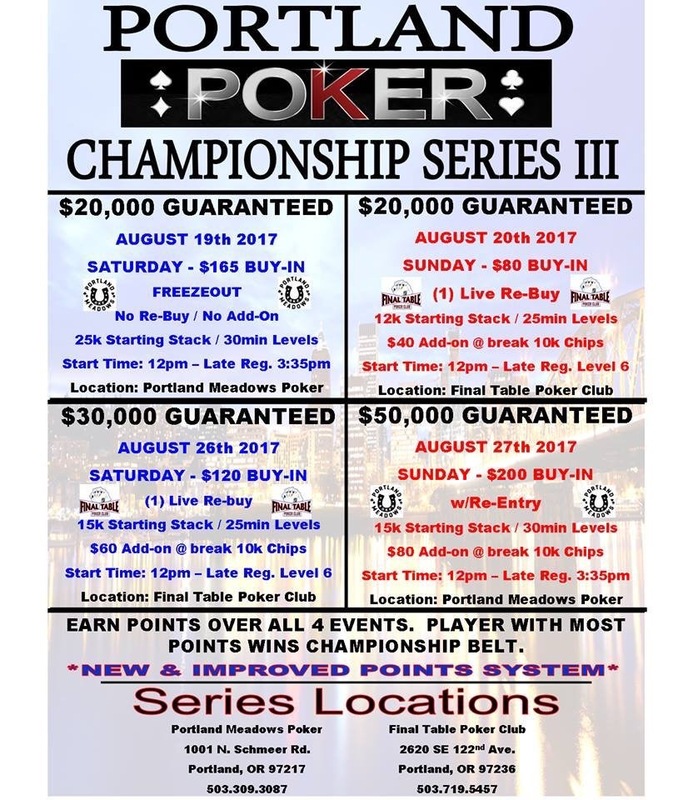 The schedule for the third installment of the Portland Poker Championship Series was announced yesterday, with the first event ten days from today. It’s four events on consecutive weekends, with two $20K GTDs up first (at Portland Meadows, then Final Table), and a $30K GTD at Final Table on the second Saturday, with the final event being a $50K GTD on Sunday, 27 August at Meadows. All events start at noon. Word is, there will be a new point system that won’t let the travesty of someone who didn’t make any of the four final tables to win player of the series. There’s a championship belt this time around. I hope it comes with extenders like airplane seatbelts. I may need them. Also just announced close on the horizon is the Muckleshoot Summer Classic, coming up 13–18 September. Yes, in classic PNW series fashion, it tangles up with the Chinook Winds series, particularly with the last two events at Muckleshoot on the same weekend as Chinook Winds’ opening 6-Max. Of couse, neither venue cleared that weekend for me—it’s Mrs. Mutant’s birthday, and she has other plans for me than playing poker. The series includes a Shootout, Limit Omaha Hi-Lo, and four standard NLHE tournaments, with between $4K and $20K added to the prize pool. There are $125 satellites every Wednesday from 16 August–6 September at 7pm, with a couple of options if you win, and four mega-sartellites (20 August and 10, 11, and 12 September) for $225 where 1 in 10 players earns entry into all of the tournaments. There’s also $14K in awards for the top 4 points earners. The Summer Poker Round-Up at Wildhorse put a couple of new names onto the leaderboard, with Kimberly Wood (Salem) jumping way up. 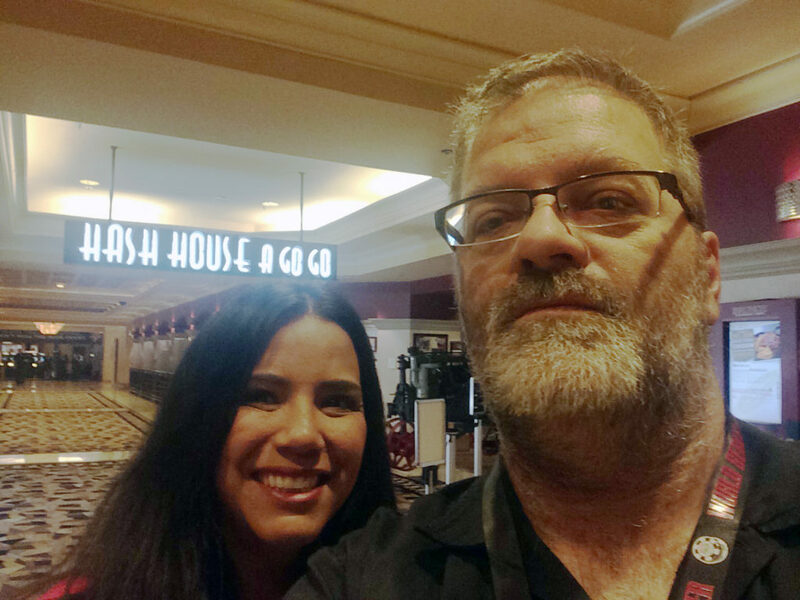 She had a single recorded cash of $416 from one of the Daily Deepstacks events at the WSOP she won first place in the $330 tournament on Saturdaythis summer until of the series. Boise’s David Smith moved onto the board with a 6th-place finish in the same game and a 2nd place in the previous evening’s tournament. That’s a lot of hours of poker. I wrote a little piece the other day about cashing in one of Ignition Casino’s Thousandaire Maker tournaments. The Bicycle Casino’s Legends of Poker runs through the rest of August. Friday is the first of eleven days of entry flights for Mega Millions XVII. Two daily flights for $160 buy-in with a $100 addon (5% of players advance to Day 2 on 22 August)); and weekend flights for $550 with 10% advancing. Also on 22 August is the $550 PL Mix game ($30K GTD with PLO, Big O, and Triple Draw Badugi). This weekend, the Golden Gates Casino Colorado Poker Championship Summer has a Deepstack Freezeout, a $3K Survivor, and a Deepstack 6-Max, along with LHE and Main Event satellites. The Main Event starts 18 August. It’s opening day for the Deerfoot Inn & Casino Summer Super Stack in Calgary. Among the featured events are a C$230 Bounty tournament with C$200 of the buyin going to your bounty, and a C$330 PLO Bounty (C$100 bounty). There’s a NLHE equivalent to that one. The Main Event is C$1,500 with three entry days and ends on the day of the eclipse. Here's a look at the structure for Event #1 $500 NL Mega Stack. The Venetian August Extravaganza starts tomorrow, with 20 events and guarantees between $5K and $80K (buyins between $125 and $340) through 20 August. The Arizona State Poker Championship at Talking Stick Resort outside Phoenix. Entry days Friday through Sunday for the $1,100 tournament (with 9am starts). Finals on Tuesday. No guarantee but an expected prize pool of $1.1M. Saturday at noon is a PLO tournament at Eugene’s Beach Poker Club. $60 buyin with $40 rebuy and addon. You can call the club early to get a 1K bonus. A week from Sunday is their big Crazy Pineapple tournament! Cactus Pete’s is in Nevada, but nowhere near Vegas. It’s just about due south of Twin Falls Idaho, in Jackpot. They host Pokermania for five days starting next Wednesday, with 12 events. WPT/Deepstacks returns to Reno Atlantis on next Thursday for 12 days of action, inclluding a $200K GTD Main Event. In just over two weeks, Heartland Poker Tour returns to Ameristar East Chicago, which is always one of their bigger stops. The hotel’s your big expense; direct flights to O’Hare airport in Chicago around the $1,650 Main Event over Labor Day weekend can be found for less than $150 roundtrip. I’ve played the Thousandaire Maker tournament on Ignition Casino (and previously on Bovada) 48 times now. It runs most every night at 8:15pm Pacific. It’s a Survivor-style tournament with a $75 buyin (and $7 fee), with a guarantee of five even $1K payouts. If the number of players meets the guarantee (67 players), another payout starts building up for sixth place (80 entries makes an even $6K in the pot, then another payout starts for seventh). No chops, only one min-cash (if any) and less than 10% of the field makes it to the money. 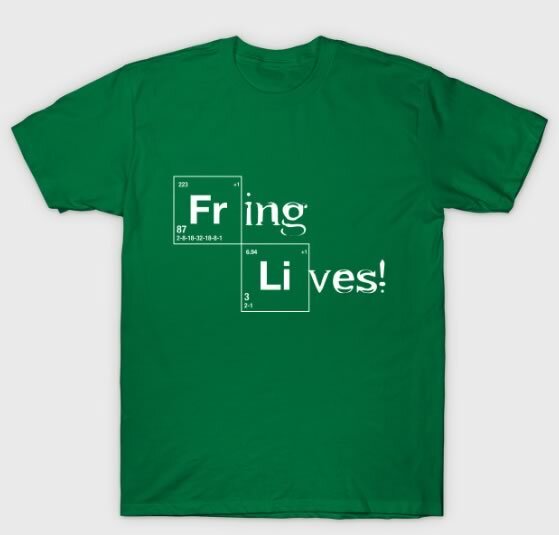 But it’s a great value overall. I’ve cashed in the Thousandaire Maker six times. If I was smart, it would be the only tournament I play, because when you cash it you’re typically making 1120% profit. So if you can beat the 7.5% cashing rate by 10% (effectively a 8.2% ITM), you are profitable. The tournament only lasts about 3 hours. By my records, I’ve spent 65 hours and ten minutes playing Thousandaire Makers since April of 2015 (coincidentally, spending almost $1 on buyins for every minute of play). And I’ve made about $2,000 in profit (a little over $31.50/hour). An average of 82 minutes per tournament. So my ITM in Thousandaire Makers is 12.5% (based, admittedly on just 48 tournaments). That’s beating the average ITM for all players by 67% and an ROI of more than 50%. Unfortunately, with just one Thousandaire Maker per day, a 30-day month would mean $2,460 in buyins, an average of $3,750 in cashes, and $1,290 in profit (about $15.4K per year). That might have been enticing in the not-too-distant past, but not these days. And not when you more or less need to give up every evening—or at least plan to be be busy between 8 and midnight. I got into the Thursday night Thousandaire Maker just before the first hour was up, despite a promise to myself not to do late entries any more. I was under the gun with 3♣7♣ on my first hand and folded. Three of the players on our (full) table have more than double the starting stack of 2500 chips. Two are under 20bb, with the small blind down to 1250. UTG/(Player 44) folds 4♠T♥ (it’s Ignition, so I can see the folded cards). UTG1/29 min-raises with A♥8♥ and UTG2/27 calls. Action folds through the small blind, and I jam the tens. This is a typical fish/new player steal attempt; the other players can see from my player number (55) that I’ve just registered. They know it’s just before break. I could just be looking to pick up 450 chips from weak hands before the blinds go up. UTG1—table chip leader at 6420—folds, but UTG2 calls with Q♣A♦ and almost 28bb behind. The board runs out 4♦J♣5♠K♠7♠. I actually had the best hand at the table. Both of the other tens were dealt, but nobody else even had a jack, much less a straight or flush. I opened to 400 and the blinds folded. CO/27 (the player I’d doubled up against) folded Q♠K♦ with a 2483 stack, which I’m pretty sure I would not have done. Tens again! On hand ten! I open to 400 and everyone folds. Out of eight other players, there was only one over card, with CO/50 holding A♥4♦. I open to 500 and everyone folds. The best hand I was against was Q♦T♦ (Portland nuts!) on the button. We’re playing eight-handed. HJ/44 on my left is the table leader with 10.8K, and CO/29 is 1K behind. The rest of us are between 3.5K and 6K. I open to 750 and the big stack 3-bets enough to put the short stack (BB/42) all in. BB shoves, and I 4-bet all in, which is called by HJ. It’s A♦K♣ v K♦A♣ (CO) v A♥K♠ (BB). The runout is 7♦T♦9♣8♣3♣ and we chop the blinds and antes for a 75 chip profit. No jacks dealt, but the other big stack on the button would have made a six-card straight with 6♣5♥. UTG2/62 shoves and with tens for the third time in 43 hands, I call, with 29 chips behind. He turns A♠T♥, the flop is a dangerous 4♣Q♦K♦, but the turn and river are 6♠6♦. I double up to 8761 and move out of the Zone. I’ve been moved to a new table and I min-raise when action folds around. BB/25 has 5.7K and 3♠A♦ and jams. I fold. Tens three times in less than 50 hands and now aces on the big blind? How lucky must I be? Everyone folds to me and. What to do with a pocket pair less than tens? There are six players at the table, and I’m actually in the bottom half. Three of us are between 7K and 8K, and the others are 9.6K, 10.3K, and 12.3K. I open to 1000, and the only called is BB/72, another of the small stacks. I’m not exactly sure what he’s thinking here, putting in an extra tenth of his stack with 6♥9♥. I c-bet the 3♠8♦A♦ flop for 1100 and he folds. I raise to 1000 and BB/7 (the third of the short stacks) jams Q♣A♣. I fold. I shove with just under 20bb and everyone folds. UTG/13 folded 9♠A♣ before I shoved. Action folds to SB/13 and he raises to 820 with 3♠A♦. He only has me covered by 500. I shove over the top and he folds. I get a walk with the best hand. I got disconnected a couple of times during this tournament. Pretty sure I’m raising and winning the hand here if I wasn’t. As it was, BB/7 got a walk with 8♦2♣. Between the disconnect and bad cards, I’d been slipping into danger territory. This hand, action folded to SB/72 (the next-to-last player to register in the tournament but a player who’d chipped up to 29K) and he shows 2♠9♦ as he folds. Finally, some sevens I can play! We’re eight-handed. UTG2/26 folds A♣8♣. I cannot fathom it. I open-shove, two bigger stacks with bad hands in the blinds fold. UTG1/26 raises to 1.7K. I typically would play this hand against a raise but chose not to here. I fold. D/11 re-shoves for 11K. UTG1 calls and the smaller stack is at risk K♠K♥ v A♥A♣. The board runs out Q♥5♣6♣T♣6♥ and player 26 is out in 16th place as we get closer to the money. Kings get cracked on the next hand by Q♦T♦. Seven players on the table and I’m one of the only two stacks under 10K. UTG1/42 has only 6K, BB/11 is at 12.7 before the hand begins, but everyone else is above $15.5K, with D/72 at nearly 25K. Action folds to him and he jams. I call with my pair and BB folds A♠K♣, missing out on a triple-up, as the board runs out 2♠7♥6♦4♠K♦. Instead, I double up. He gets knocked out on the next hand with a pair of sixes calling another shove from player 72, who catches an ace on the turn to go with his Mutant Jack (suited AxJx). The strategy a lot of late-entrants take (and sort of need to take given their initial short-stack status) is to shove repeatedly. This tends to take the ‘fun’ of poker out of the game for me, at least, which is why I try not to join a tournament in the later stages of registration. I can’t think it would be an effective strategy in cash games. Anyhoo…after losing a third of his stack to me eight hands earlier, then knocking out a player, player 72 is up to 27.6K and we are back in the same positions as our last run-in. He shoves, I call. He has 7♦J♣. I pop a queen on the flop and double up. Board is T♣T♠Q♦4♣K♣. We’re within five spots of the money, with five full $1K prizes and sixth place paying $475. I’ve got the chip lead, and I could actually sit back at this point and do nothing. Does that mean I will do nothing? No. I raise to 2400. Ten hands ago, BB/72 had a stack that would have gotten him handily into the money, now he’s one of three 15–17bb short stacks at the table. He has J♠J♣ and shoves12.3K. I call, the board is 5♥T♣6♦A♥7♣ and he’s out in 10th place. Buh-bye. The final table starts on the next hand with four stacks under 20bb. That;s the same number of players that have to bust before we hit the full $1K packages. Only 3 players have more than 20K, and I have 20K more than the player in second place. The player on my left took over the chip lead a few hands earlier when he won a race with jacks to eliminate the 9th place finisher. He’s got about 1K more than me. Two players are under 10bb, three others are between 10 and 16bb. The ideal strategy here is to let them cut each other out for the most part. However, I min-raise from UTG1 after the one other player with more than 20bb (31) folds. The chip leader has 4♣4♦, but folds, leaving only the five small stacks, none of whom want to pull the trigger lest someone behind them shoves. They all fold to BB/17—one of the shortest stacks—with just 3♥8♠. He packs it in and drops to the shortest stack. So much has happened. That short stack from the last hand managed to get AxKx in against another short stack’s AxQx and double up, then bumped up again a couple of times while two players went out. The money bubble has burst, and now we’re just waiting to see who gets the not-insignificant sixth-place prize ($475) as opposed to the $1K. The chip leader to my left (still player 29) has 43.8K—over 27bb). On my right is player 31 with roughly the same stack as me. The other three are 18bb, 13bb, and 7bb. Nobody wants to miss out on the extra $525. I could theoretically fold aces here is one of the other two big stacks shoved. I wouldn’t, but theoretically. As it happens, Everyone folds. Do my big blind aces stink? D/31 min-raises here with T♣A♣. I don’t lilke this play myself because the only other stacks who could keep him from the big prize are the only ones left to act. He has enough chips to wait it out, courting one or the other of us having a premium hand is bad. The short stack (SB/7) has A♥4♥ and just 6bb. He shoves, Not a bad plan given that BB/17 has only 13bb and no matter what happens, he’s getting 480% ROI. Unfortunately, BB has A♣J♠ and makes the call. The flop is bad: A♠5♦5♣ meaning a chop is only possible with an ace, king, or queen, but the turn brings some more outs with 3♥ providing an opportunity for a win. The river is 9♦, though, which ends the tournament. 148 hands. Two hours and thirty minutes. +1120%ROI. MTV debuted 35 years ago (1 August 1982) with this song. What the hell happened? If you’ve been in Portland Meadows Poker Room over the past couple of months, you may have noticed a little roped-off area in one corner, with a very special table. It’s part of a Radio Frequency ID (RFID) setup akin to those in use by everyone from Live at the Bike to the World Series of Poker. Sensors in the table can read chips in a special (expensive) deck of cards. The data feeds into a computer program that—with the aid of someone entering bet sizes, call, and folds—can track the action with a multiple-camera setup, displaying cards and equities as the hand plays out. There have been a couple of run-throughs already, but the first big trial was Monday evening. No announcements yet about exactly what’s going to be done with the setup, but I feel safe in saying that I was Monday’s #garbagehuman. Rafael Reis of Kent chopped the last two places of an Aria Poker Classic event in mid-July, taking first and a little more than the 2nd-place finisher in cash. Over at the Venetian/Mid-States Poker Tour Main Event, Dylan Linde of Idaho, Dylan Wilkerson and Matt Affleck (both Washington) had 27th, 34th, and 42nd finishes (respectively). Dan Barker of Poulsbo didn’t make quite as much money as those guys, but he did get a better multiplier in the Venetian $30K GTD NLHE Rebuy (106 entries and 225 rebuys). Finally getting out of Vegas, William Zaiss made the final table of the Ante Up World Championship Monolith at Thunder Valley. With 855 entries, the $250K GTD swelled to $342K. After a threatened closing last fall, then a devastating fire on the upper floors of the building hosting the Rialto in downtown Portland, an announcement went up over the weekend that the poker tables were going to be be back as of Tuesday morning. According to a Facebook post by Sean Dalton, the game is afoot! It’s time for another Final Table First Friday $20K GTD! Friday night at 7pm. Just $80 (with 1 live rebuy), and $40 for an addon. Plus the $15 club fee for the day. Saturday at 2pm is the next installment of the Poker in Cambodia tournaments at The Game. Two more $2,500 packages (or cash) available, $100 buyin and rebuy with $50 addon. They’ve also announced a special Bounty tournament for 20 August! Remember, your feedback is always important. Like, why couldn’t someone mention to me last week’s title said August instead of July for an entire week? Why don’t people send me updates about special events? Why the heck can’t Muckleshoot or Tulalip get their monthly schedules done before the month actually starts? I’m just a guy, y’know? The Ante Up Poker Tour World Championship at Thunder Valley is coming to a conclusion with the $500K NLHE Main Event starting Friday ($1,650 buyin). There are entry flights at 11am Friday and Saturday with Day 2 wrapping it up on Sunday. The Bicycle Casino’s Legends of Poker has its own $500K GTD this weekend with 2 flights each day Friday to Tuesday ($240 entry), and Day 2 on Wednesday. Players with multiple stacks qualifying for Day 2 get $1,500 for each extra stack. Golden Gates Casino kicks off the Colorado Poker Championship Summer, tomorrow (nothing like having the schedule available just a couple days before the start of action). The first big event is a $100K guarantee with a $400 buyin. The Main Event ($1,100) starts 18 August. Deerfoot Inn & Casino in Calgary brings back their Summer Super Stack next Wednesday. Amond the featured events are a C$230 Bounty tournament with C$200 of the buyin going to your bounty, and a C$330 PLO Bounty (C$100 bounty). There’s a NLHE equivalent to that one. The Main Event is C$1,500 with three entry days and ends on the day of the eclipse. The Venetian August Extravaganza starts next Thursday, with 20 events and guarantees between $5K and $80K (buyins between $125 and $340) through 20 August. 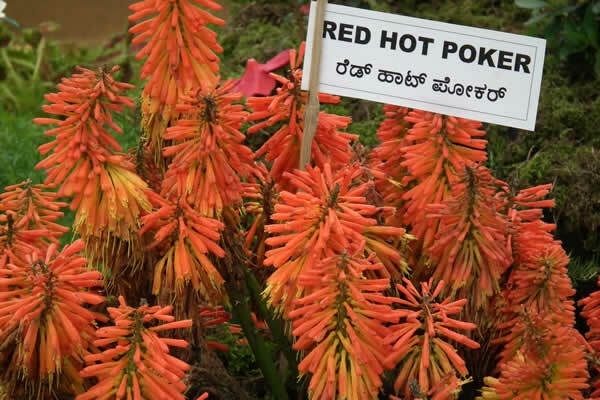 Even deeper into the red hot zone is the Arizona State Poker Championship at Talking Stick Resort outside Phoenix. Entry days next Thursday through the following Sunday for the $1,100 tournament (with 9am starts). Finals on Tuesday, 15 August. No guarantee but an expected prize pool of $1.1M. Cactus Pete’s is in Nevada, but nowhere near Vegas. It’s just about due south of Twin Falls Idaho, in Jackpot. They host Pokermania from 16–20 August, with 12 events. WPT/Deepstacks returns to Reno Atlantis on 17 August for 12 days of action, inclluding a $200K GTD Main Event.